Post Cards are vintage and archaic in some ways.... often people are on social media sending pictures and notes of their events... tweets and texts... so the long lost love of actual mail is often forgotten. 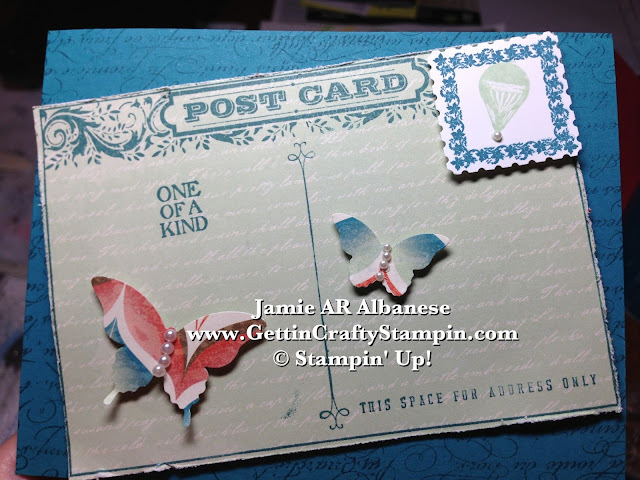 Here is a vintage card created with our New Post Card Stamp(130369) that embraces the old with the fun of the new! With our Venetian Romance Designer Series Paper (#130144) and this lovely scrolled Pistachio Pudding page that reminds me of a recent find in my Nanna's post card (recently re-discovered in my son's baby box). 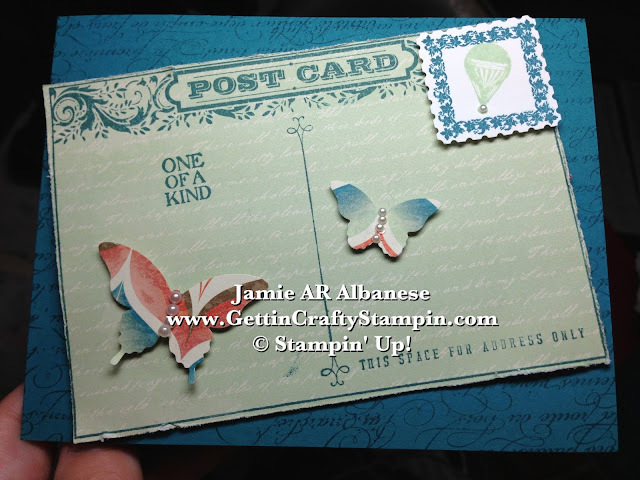 Our Island Indigo ink (#126986) and this Post Card stamp really work well together. 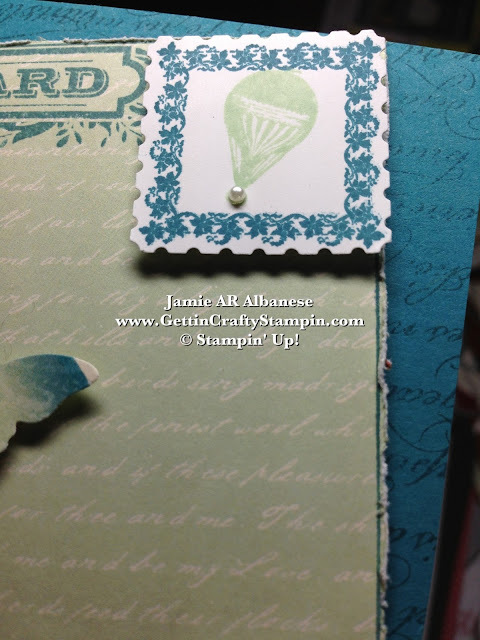 Distress the edges, easily, with our Stampin' Distress Tool (#127562). This quickly and safely roughs up the edges and adds to the aged look. With Island Indigo ink on Island Indigo card stock (#122923) this En Francais stamp (#128562) mimics the pattern on the Venetian Romance DSP. It's elegant and subtle... looks vintage too! Add luxury and luster with our adhesive backed Pearl Basic Jewels. With 150 pearls of varying sizes that are adhesive backed... you can easily add some luxury and luster to any project!! Flipping the Venetian Romance Designer Series Paper over for this beautiful pattern... 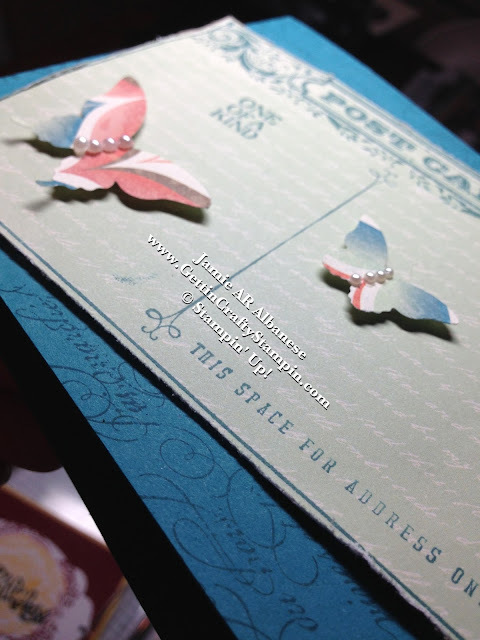 The Bitty Butterfly punch (#129406) and Elegant Butterfly punch (#127526) embrace the elegance and beauty of this pattern. Did we bring the lost-art of Post-Card sending BACK?!?! Add some Vintage love to a New Card?? Leave me a comment and let me know what you think!! Pin this, Share This, Tweet, Facebook, Email, Istagram and more this.... and bring me and these project to others.... spreading the love while supporting my passion for my stamping business. When we open our mail boxes, we are inundated with junk mail and more... the lost art of writing a note or card and sending it is one that is sure to brighten anyone's day! These long-lasting treasures are often stored and looked at long after the receipt of the mail. Iiiii still have post cards and letters my Great Uncle sent me, encouraging me in a dark world to be a light. Mail my Grand Parents sent from trips to Africa (visiting my Great Uncle and Great Aunt who served as Missionaries there for over 20 years), their trips to Europe, Alaska and more.. they are long gone but these letters are a light when we stumble on them.... So RESURRECT the long-lost art of sending a note of encouragement, celebration or just touching base.... who knows how long it may live on (where Social Media falls short and is often forgotten...). I hope to see you by, again, and soon! !